In India the Gangotri Glacier is the largest glacier at the headwaters of the Bhagirathi River. The false-color image below provided by NASA shows the retreat of Gangotri Glacier, situated in the Uttarkashi District of Garhwal Himalaya. It is one of the larger glaciers in the Himalaya, and like all of the nearby Himalayan glaciers is retreating significantly. The Bharigrathi River has the Tehri Dam, a 2400 mw hydropower facility. With an area of 286 square kilometers Gangotri Glacier (Singh and others, 2006) provides up to 190 cubic meters per second of runoff for this river. 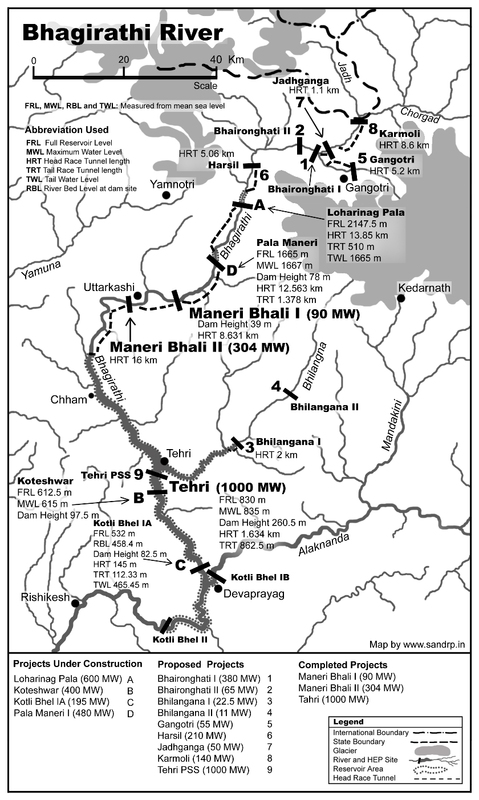 Gangotri Glacier provides hydropower as it passes three hydropower plants generating 1430 MW, including the 1000 MW Tehri Dam and reservoir and maneri Bhali I and II, see map below. The Tehri also provides flood control, such as this past week of June 17, 2013. The Tehri Reservoir level rose 25 m within 48 hours which is a storage of approximately 1.3 billion cubic meters. 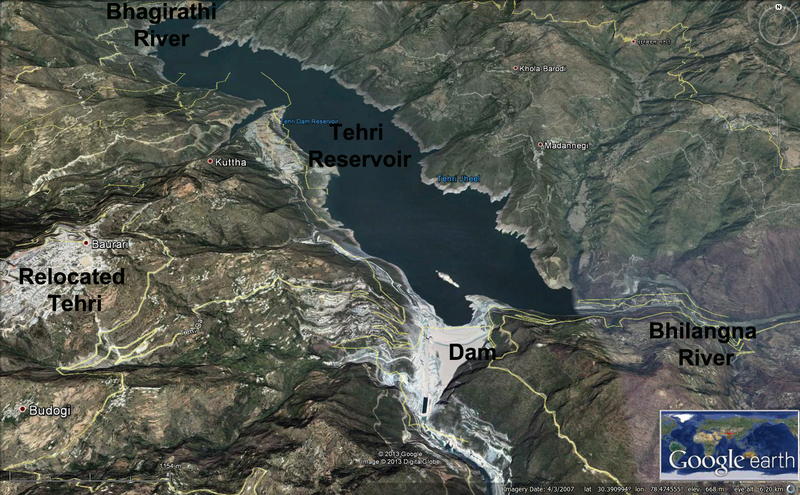 Below is a view of the Tehri Reservoir, images of the dam and its operations are here. Gangotri Glacier retreated 26.5 meters per year form 1935-1971. 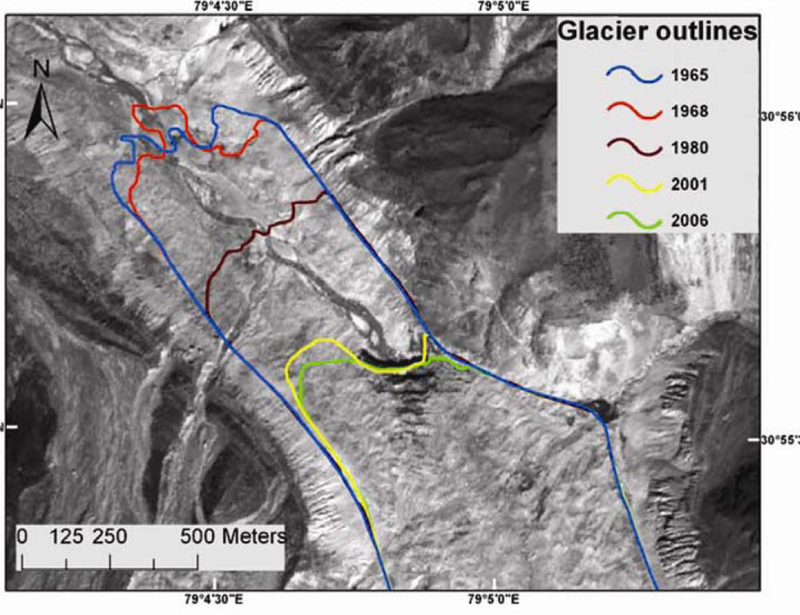 From 1968-2006 the glacier retreated 800 meters, close to 20 meters per year (Bhambri et al, 2012). Srivastava et al (2013) indicate the retreat rate of 21 m/ year from 2004-2010. The glacier continues to thin and tributary inflow decline, while the thick heavily insulated by debris terminus retreat is slow. Srivastava (2012) published a report with numerous terminus pictures though they do not have a common reference point beginning on page 90. Where the river exits the glacier is referred to as Gomukh. Here we compare both Landsat and Google Earth images during the 2000-2013 period. First the 2000 and 2013 Landsat images. 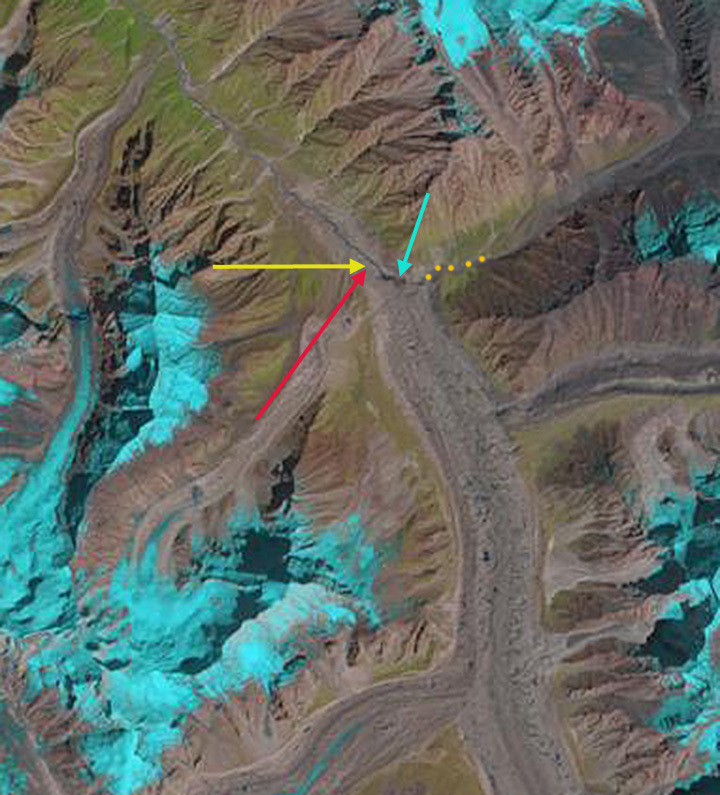 A 2000 and 2013 landsat image pinpoint the terminus change, the yellow and red arrows converge on the 2000 location of Gomukh. 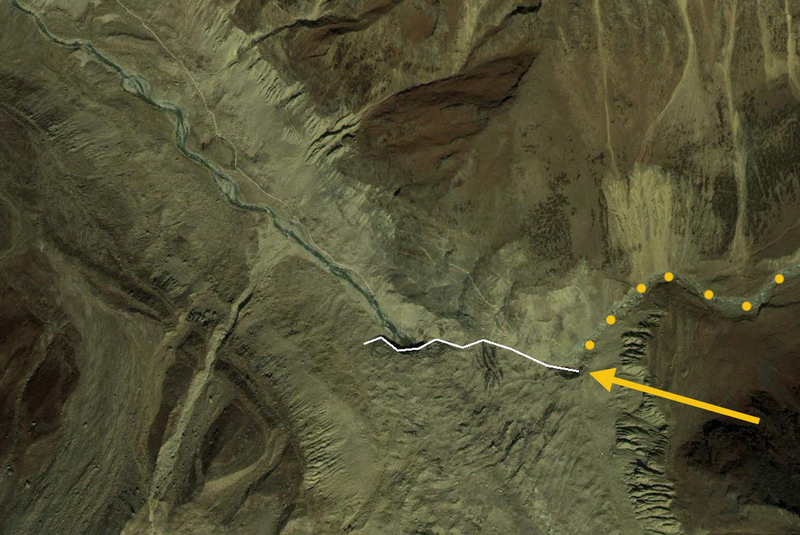 The blue arrow indicates the mouth of a side valley from the east that is at the terminus in 2013 and actively cutting the face, which is not the case in 2000. 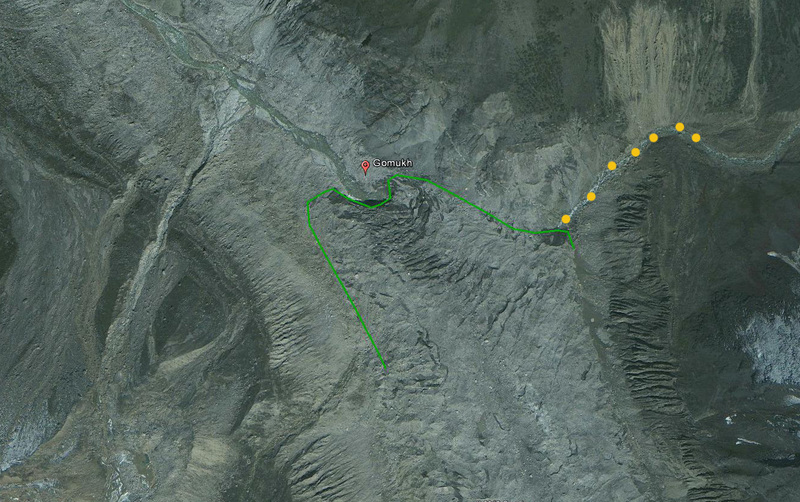 The orange dots indicate the course of this stream. A 2006 Cartosat image from Bhambri et al (2012) can be compared to the 2010 and 2013 Google Earth images. 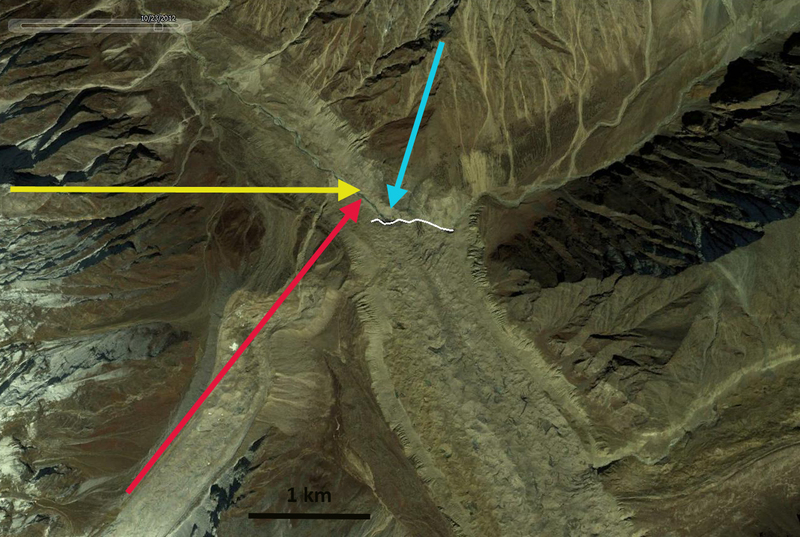 In Google Earth the 2010 image gives a clear view of Gomukh which can be compared to the 2006 Cartosat image from Bhambri et al (2012). In 2000 and even 2006 this was not the case. 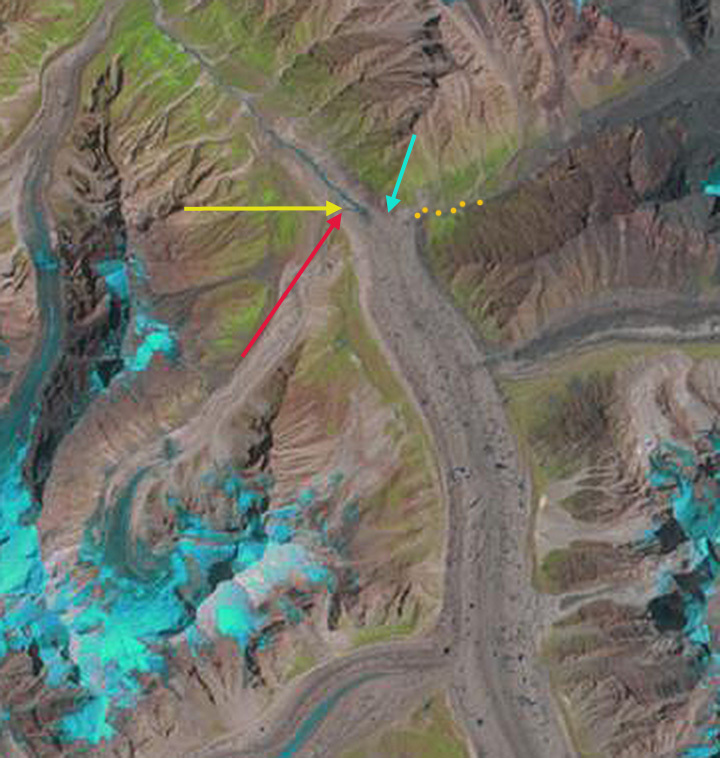 A 2013 Google earth also indicates this point,with the glacier having retreated to the side valley from the east. The retreat from the location of Gomukh in 2000 to 2013 is 240-270 m, approximately 20 m per year as noted by Srivastava et al (2013) for a shorter interval. This glaciers remains over 30 km long, and is not in danger of disappearing anytime soon. The lower section of the glacier is heavily debris covered, which slows melting. The debris cover prevents black carbon-soot from enhancing melt over most of the ablation zone. The upper reaches of the glacier extends above 6000 meters and remains snow covered even during the summer melt season June-August, as this is also a main accumulation season due to the summer monsoon. This is different from other alpine regions, where the melt season is also the dry season, here it coincides with the wet season and the accumulation season on the upper glacier. Compare the differences in hydrographs from Thayyen and Gergen (2009) Figure 3 and 4. The new snowcover on the upper glacier also limits the impact of black carbon or soot on ablation. 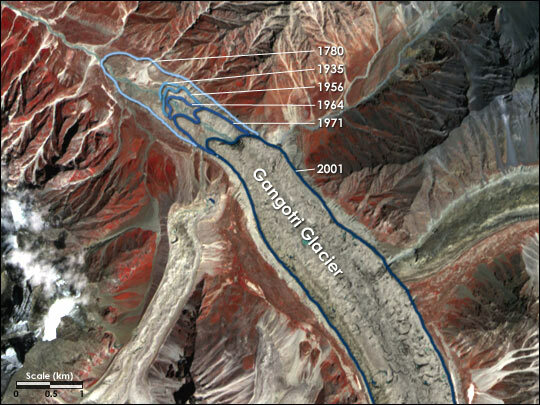 The glacier is fed from avalanches off of the even larger area of mountains above 6000 meters adjacent to it. 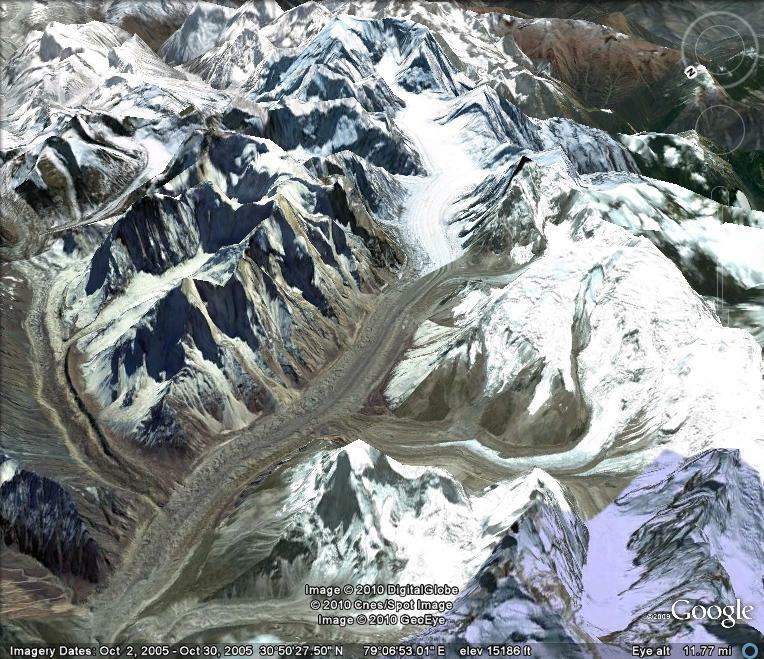 This is one of many glacier in the Himalaya that is being tapped for hydropower. The retreat is slower than that of nearby Malana Glacier and Samudra Tupa Glacier but similar to Durung Drung Glacier. This entry was posted in Glacier Observations and tagged gangotri glacier melt, gangotri glacier retreat, glacier hydropower, glacier melt himalaya, himachal pradesh glacier retreat, himalaya glacier retreat, India glacier retreat, uttarakhand glacier retreat. Bookmark the permalink.